India’s first 3G Mobile service operator Mahanagar Telephone Nigam Ltd (MTNL) today slashed the price of its plug-n-play 3G USB Device (3G Data Card) from Rs.1799 to Rs. 1699 for its customer in Delhi telecom circle. MTNL’s new 3G Data card (Terracom LW272) will be available at all Sanchar Haats across Delhi from 22 March, 2011 onwards. The operator offers free 3G prepaid SIM card and free data transfers (Download and Upload) up to of 2 GB for 1 months on the purchase of 3G Data Card. MTNL’s 3G Wireless Broadband service comes with the attractive Limited and Unlimited 3G data tariff plans for postpaid and prepaid starts from Rs. 50 to Rs. 1650. MTNL Also providing “Advance Rental Data Card Unlimited Plan” whereas Unlimited 3G Data Access will effectively cost at just Rs.750 per month for Home and Roam usage. 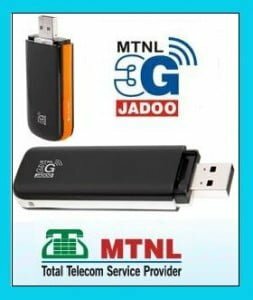 MTNL 3G Data Card (Terracom LW272) will enable anytime, anywhere instant High Speed wireless Internet connectivity up to 3.6 Mbps for laptops and other computing devices, thereby significantly benefiting business users, roamers and travelers. It is also depends on you mobile operators also. i the both option you give above is gives you the maximum spped but a dedicated 3g data card with a speed 7.2mbps is very good. I am having Nokia X6 which is having HSDPA and can deliever speed upto 10 Mbps.